The first time I put on my LatherMitts, Sebastian giggled. I told him it was time to wash and he frowned until he saw me put on our new mitts. I slipped them on, lathered up some natural baby soap, and started washing. 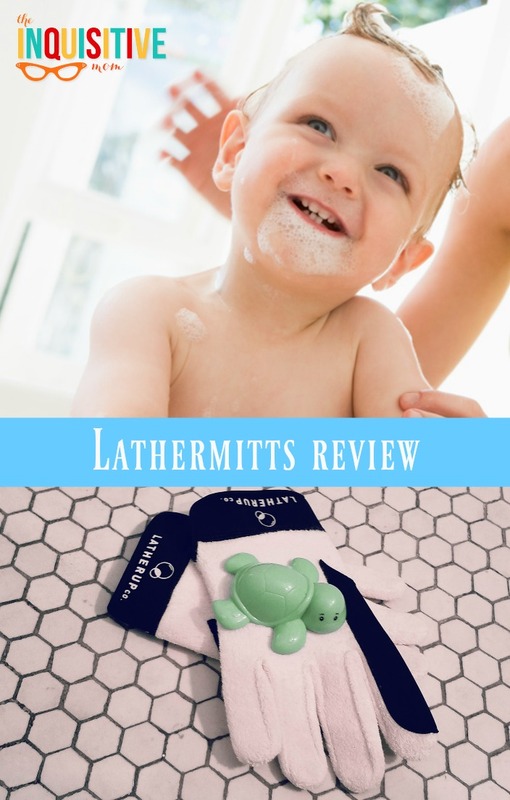 Suddenly, wash time became cozy, giggly, and fun and I looked forward to bringing you our LatherMitts review. LatherMitts inventor, Sarah Stapp, found traditional baby washcloths ill-suited for the job. They were too small and did nothing to secure squirmy little ones during wash time. She decided that soft, well-fitting gloves with finger grips made more sense and LatherMitts were born. 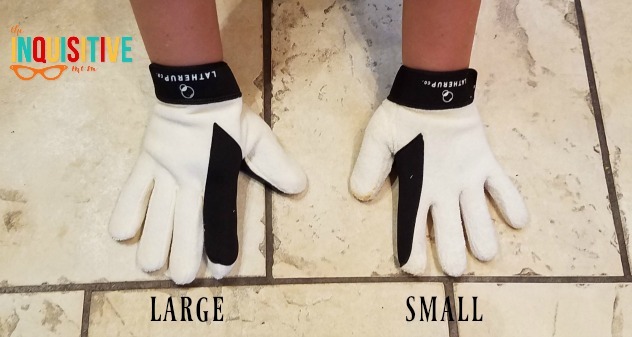 Safety: The gentle neoprene grip that lines LatherMitts’ thumb and forefinger ensure that squirmy, slippery kids are secure and safe in your hands. Neoprene, commonly used in wetsuits, is hypoallergenic, non-slip and is naturally resistant to oil, mildew, and mold. Dexterity: Get into hard-to-reach places like behind ears and under chins with ease. Value: LatherMitts can be rewashed and reused again and again the same way you would use a washcloth. Options: LatherMitts come in sizes small to extra large, so mom and dad can both cover bath time duties. LatherMitts are made of cotton terrycloth, similar to washcloths you would purchase for baby. They are currently available in cream and black, but I would love to see more fun, vibrant colors (hinted at on the website) or patterns. The neoprene grips on the thumb and forefinger are what truly make these bath mitts stand out. This addition helps you get a good hold of a squirmy baby in a gentle, comforting way. This is probably the top feature we discovered during our LatherMitts review. You simply slip them on both of your hands and rub some baby soap into a lather. One hand securely holds an uncertain sitter or a baby determined to walk or crawl away. The second hand then gets to scrubbing. Our little guy is nearly two and will sit fairly well for washing, so I quickly wipe him down with two hands, getting easily behind the ears and in his neck folds before he gets too impatient. LatherMitts kindly sent us two pairs of gloves, sized small and large. I have relatively small hands and the small fit me comfortably and snug. While I appreciate the idea of accurate sizing, it’s a bit impractical for our family. We are not likely to have more than two pairs of $20 bath mitts, so one-size makes more sense. I tried using the large gloves during bath time and, while they weren’t as secure, they worked fine. I think the value of LatherMitts really depends on how often you bathe your child and how often you do laundry. Our little guys bathe an average of three times per week, so the mitts usually get a wash mid-week. If you don’t have multiple pairs, you will still need washcloths as a back-up, but they are only a few dollars. Overall, LatherMitts are an awesome bath time solution, but I am not sure how many families would purchase multiple sets to make them the only bathtime solution. I definitely prefer LatherMitts over traditional washcloths or fingerless wash mitts. They fit comfortably and give caregivers the dexterity needed to give a quick, thorough wash. Plus, they make baby giggle every time we use them and you can’t really beat that! 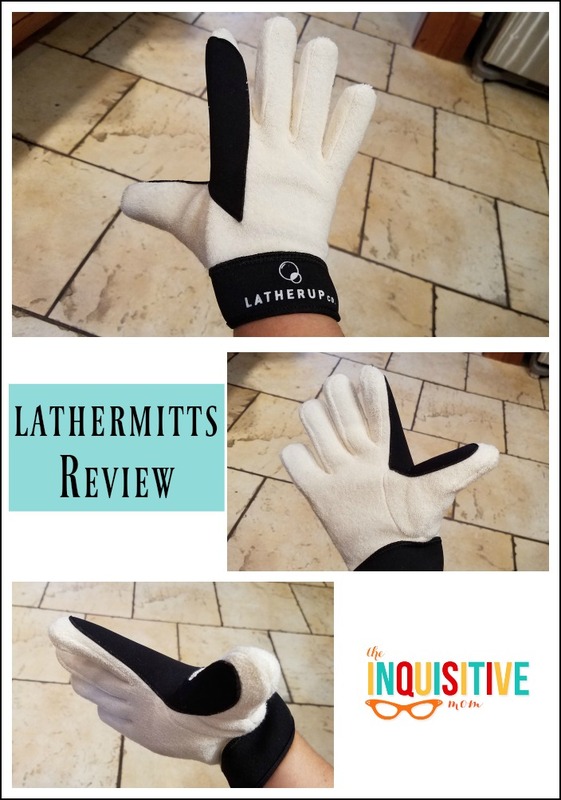 Thank you to Lather Up Co for sponsoring this LatherMitts Review. Giveaway – Look for LatherMitts in my upcoming family-friendly giveaway! Disclaimer: I received product in exchange for my honest review. All opinions are my own. Thanks for the review! LOVE those cute pictures, too!